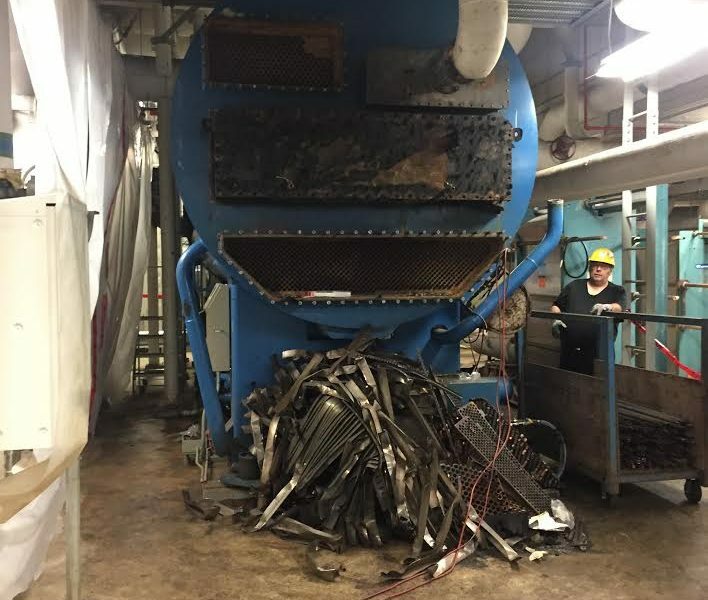 Vancouver General Hospital’s (VGH) environmental footprint just got a little lighter by getting rid of an inefficient absorption chiller. Just check out the massive machine below! Its removal has made space for a new heat recovery chiller that will pull waste heat from one building and use it to heat another building and its hot water. The new heat recovery chiller is about 20 times more efficient and is expected to offset 40,000 GJ of natural gas used in the production of steam to heat the building and hot water. This will also see a reduction of 2,000 tons of GHG emissions. The load match was nearly perfect, says Chris Goodchild, who conducted the energy study that proved the installation would be a good fit. Natalie Vadeboncoeur analyzed trend data to understand how the heating and cooling plants performed throughout the seasons and found that the rejected heat was more than enough to heat the building in 3 seasons and most of the winter. If phase 2 of the project is approved, a second chiller would be replaced and offset an additional 2,000 tons of GHGs.